Kim is delighted to announce that he and Maura McHugh are co-writing a mini-series based in the Hellboy universe created by Mike Mignola, and published by Dark Horse Comics. 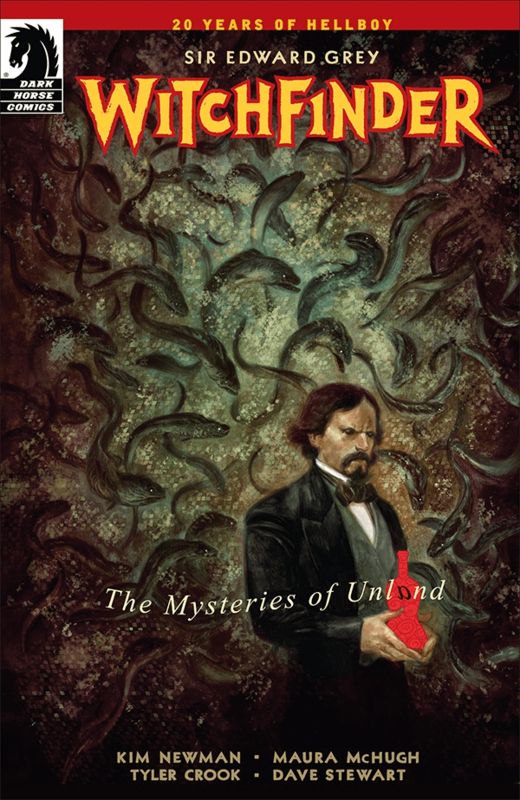 It will be a five-issue Sir Edward Grey: Witchfinder story called The Mysteries of Unland, with art by Tyler Crook, coloured by Dave Stewart, covers by Julian Totino Tedesco, lettered by Clem Robins, and edited by Scott Allie. This March marks 20 years of the Hellboy franchise (often referred to as the Mignolaverse), and Kim and Maura are excited to be a part of this vibrant and entertaining world. You can read an exclusive interview with Kim and Maura over on Comic Book Resources about the project. Here’s a slideshow of The Mysteries of Unland teaser campaign that’s been showcased on Dark Horse Comic’s Facebook and Twitter feed for the last few weeks, during which information has slowly been revealed about the project and the team working on the title. It’s also spawned the #gotounland hashtag on Twitter.